Irish ornament is an Irish girl with red hair and shamrocks. This Irish ornament depicts a lass that is constructed with a wooden clothespin, along with fabric. 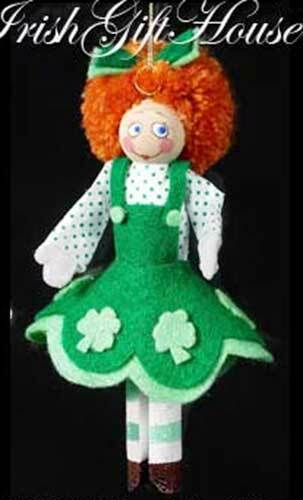 The Irish girl ornament is enhanced with red hair along with shamrocks on her dress. The Irish lass ornament measures 6 1/2" tall and she is ready to hang on your Christmas tree with the included gold cord. The wooden Irish ornament is received with a shamrock history card, complements of The Irish Gift House. Irish ornament is an Irish boy with red hair and shamrocks.